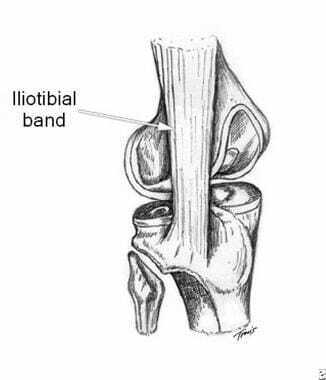 Iliotibial band syndrome (ITBS) is the result of inflammation and irritation of the distal portion of the iliotibial tendon as it rubs against the lateral femoral condyle, or less commonly, the greater tuberosity. This overuse injury occurs with repetitive flexion and extension of the knee. Inflammation and irritation of the iliotibial band (ITB) also may occur because of a lack of flexibility of the ITB, which can result in an increase in tension on the ITB during the stance phase of running. See the image below. 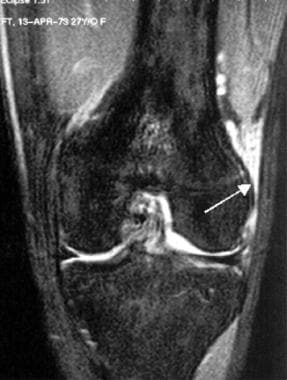 In this 27-year-old female marathon runner with anterolateral pain superior to the joint line, a coronal fast spin-echo T2-weighted magnetic resonance imaging scan with fat suppression demonstrates edema between the iliotibial band and the lateral femoral condyle (arrow). The edema's location is consistent with a clinical diagnosis of iliotibial band syndrome. Other causes or factors that are believed to predispose an athlete to ITBS include excessive internal tibial rotation, genu varum, and increased pronation of the foot. The iliotibial band (ITB) is a dense fibrous band of tissue that originates from the anterior superior iliac spine region and extends down the lateral portion of the thigh to the knee. The ITB has insertions on the lateral tibial condyle (ie, the Gerdy tubercle) and the distal portion of the femur. When the knee is extended, the ITB is anterior to the lateral femoral condyle. When the knee is flexed more than 30º, the ITB is posterior to the lateral femoral condyle. See the images below. Iliotibial band at the lateral femoral condyle, with the posterior fibers denoted. No known association exists between race and iliotibial band syndrome. Iliotibial band syndrome usually is seen in individuals aged 15-50 years, an age range that generally includes active athletes. Fredericson M, Weir A. Practical management of iliotibial band friction syndrome in runners. Clin J Sport Med. 2006 May. 16(3):261-8. [Medline]. Hamill J, Miller R, Noehren B, Davis I. A prospective study of iliotibial band strain in runners. Clin Biomech (Bristol, Avon). 2008 Oct. 23(8):1018-25. [Medline]. Grau S, Maiwald C, Krauss I, Axmann D, Horstmann T. The influence of matching populations on kinematic and kinetic variables in runners with iliotibial band syndrome. Res Q Exerc Sport. 2008 Dec. 79(4):450-7. [Medline]. Hafer JF, Brown AM, Boyer KA. Exertion and pain do not alter coordination variability in runners with iliotibial band syndrome. Clin Biomech (Bristol, Avon). 2017 Aug. 47:73-8. [Medline]. Foch E, Reinbolt JA, Zhang S, Fitzhugh EC, Milner CE. Associations between iliotibial band injury status and running biomechanics in women. Gait Posture. 2015 Feb. 41 (2):706-10. [Medline]. Foch E, Milner CE. The influence of iliotibial band syndrome history on running biomechanics examined via principal components analysis. J Biomech. 2014 Jan 3. 47 (1):81-6. [Medline]. Musick SR, Bhimji SS. Snapping Hip Syndrome. 2018 Jan. [Medline]. [Full Text]. Khaund R, Flynn SH. 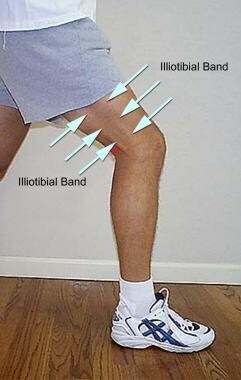 Iliotibial band syndrome: a common source of knee pain. Am Fam Physician. 2005 Apr 15. 71(8):1545-50. [Medline]. [Full Text]. Sher I, Umans H, Downie SA, Tobin K, Arora R, Olson TR. Proximal iliotibial band syndrome: what is it and where is it?. Skeletal Radiol. 2011 Dec. 40(12):1553-6. [Medline]. Grau S, Krauss I, Maiwald C, et al. 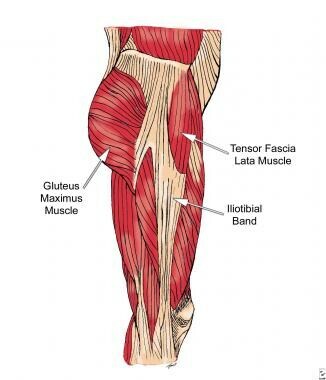 Hip abductor weakness is not the cause for iliotibial band syndrome. Int J Sports Med. 2008 Jul. 29(7):579-83. [Medline]. Louw M, Deary C. The biomechanical variables involved in the aetiology of iliotibial band syndrome in distance runners - A systematic review of the literature. Phys Ther Sport. 2014 Feb. 15 (1):64-75. [Medline]. Phinyomark A, Osis S, Hettinga BA, Leigh R, Ferber R. Gender differences in gait kinematics in runners with iliotibial band syndrome. Scand J Med Sci Sports. 2015 Dec. 25 (6):744-53. [Medline]. Aderem J, Louw QA. Biomechanical risk factors associated with iliotibial band syndrome in runners: a systematic review. BMC Musculoskelet Disord. 2015 Nov 16. 16:356. [Medline]. [Full Text]. Stickley CD, Presuto MM, Radzak KN, Bourbeau CM, Hetzler RK. Dynamic Varus and the Development of Iliotibial Band Syndrome. J Athl Train. 2018 Feb. 53 (2):128-34. [Medline]. Mucha MD, Caldwell W, Schlueter EL, Walters C, Hassen A. Hip abductor strength and lower extremity running related injury in distance runners: a systematic review. J Sci Med Sport. 2017 Apr. 20 (4):349-55. [Medline]. Seijas R, Sallent A, Galan M, Alvarez-Diaz P, Ares O, Cugat R. Iliotibial band syndrome following hip arthroscopy: an unreported complication. Indian J Orthop. 2016 Sep. 50 (5):486-91. [Medline]. [Full Text]. Mesiha M, Bauer T, Andrish J. Synovial sarcoma presenting as iliotibial band friction syndrome. J Knee Surg. 2009 Oct. 22 (4):376-8. [Medline]. [Full Text]. Ilizaliturri VM Jr, Martinez-Escalante FA, Chaidez PA, et al. Endoscopic iliotibial band release for external snapping hip syndrome. Arthroscopy. 2006 May. 22(5):505-10. [Medline]. Hariri S, Savidge ET, Reinold MM, Zachazewski J, Gill TJ. Treatment of recalcitrant iliotibial band friction syndrome with open iliotibial band bursectomy: indications, technique, and clinical outcomes. Am J Sports Med. 2009 Mar 13. [Medline]. Michels F, Jambou S, Allard M, Bousquet V, Colombet P, de Lavigne C. An arthroscopic technique to treat the iliotibial band syndrome. Knee Surg Sports Traumatol Arthrosc. 2009 Mar. 17(3):233-6. [Medline]. Noehren B, Schmitz A, Hempel R, et al. Assessment of strength, flexibility, and running mechanics in men with iliotibial band syndrome. J Orthop Sports Phys Ther. 2014 Mar. 44(3):217-22. [Medline]. Weckstrom K, Soderstrom J. Radial extracorporeal shockwave therapy compared with manual therapy in runners with iliotibial band syndrome. J Back Musculoskelet Rehabil. 2015 Jul 6. [Medline]. Pierce TP, Mease SJ, Issa K, Festa A, McInerney VK, Scillia AJ. Iliotibial Band Lengthening: An Arthroscopic Surgical Technique. Arthrosc Tech. 2017 Jun. 6 (3):e785-9. [Medline]. [Full Text]. The Thomas test can be used to evaluate restriction in the iliotibial band and hip flexors. This illustration demonstrates iliotibial band syndrome stretching performed in a side-lying position.